Corserva provides the same plans that are available directly from Microsoft. By making this service part of a comprehensive solution with Corserva, you gain the advantage of a single point of contact for service administration, guarantee a smooth migration, and gain technical support when you have problems with your Office 365 environment. View this pricing sheet for information about Office 365 for business plans and pricing. Corserva offers Office 365 migration services and managed services for businesses who want to gain a robust productivity solution for employees and free up their internal IT staff from dealing with end user issues. The cloud-based solution is provided for a low monthly subscription price with 24x7x365 support. You can run your business more effectively using Microsoft Office 365 instead of individual software packages. With Office 365, you get everything you need to get work done anytime, anywhere. But the work involved in migrating to Office 365 may take too much time away from your limited IT staff. Outsourcing the migration of Office 365 to Corserva will save you time and money in the long run. Moving forward, we can also manage Office 365 for you and provide technical support for your users, 24x7x365 from our US-staffed help desks. Whether you’re working in your office, from home or on the go, Microsoft Office 365 offers a cost-effective alternative to purchasing and maintaining your own Microsoft Exchange software and servers. With Office 365, you always have the latest versions of MS Office and you can create, edit, and share files from your PC, Mac, and mobile devices with anyone in real time. Office 365 combines familiar Microsoft productivity, collaboration, and communication tools to support your employees wherever they are, on any device. Why should you outsource your Office 365 migration? Experience – The amount of experience you have performing cloud migrations will greatly impact how smoothly the migration will go. Quality – There is a big difference between a complete migration that successfully brings over all of the data, settings, and personalization items versus one that misses things. IT Staff Cost – When you migrate to Office 365 using your own internal IT staff, that staff is unavailable for other work. End User Employee Cost – If there are issues during the migration that result in downtime for users, the impact to the business can be significant. Risk Tolerance – How critical to your business is maximizing uptime? What is the tolerance for risk of your leadership team? Access to email is absolutely critical to today’s business operations. Microsoft Office 365 offers a cost-effective alternative to on-premise Exchange, which requires investment in software and servers. With Office 365, you always have the latest versions of Office, and you can create, edit, and share files from your PC, Mac, and mobile devices with anyone in real time. By outsourcing this key function to Corserva, you ensure that your team has access to email at any time, from any device, whether PC, Mac, tablet, etc. And in the event a user has any issues, there is a single point of contact available 24x7x365. Our US-based help desk support has the depth and breadth of experience to solve user issues timely and professionally, lightening the burden on your in-house IT staff. By selecting an MSP to provide Microsoft Office 365 as a service to your organization, you can reap the rewards of using this service as one part of a comprehensive managed IT services contract that includes IT remote monitoring and alerting. By having your MSP manage your Office 365 application, you can have your partner take care of new user additions, upgrades, and deletions, as well as account administration. If you are ready to migrate your Microsoft Exchange email to Office 365, Corserva can help. We make the transition easy for you by following best practices in implementation, and ensuring your team is informed every step of the way, including planning, setting up, migrating, and managing Office 365. 3. Migrate all mailboxes to Office 365, including all email messages, calendar, contacts, and tasks. 4. Verify features and functionality are successfully operating. Corserva has extensive experience migrating clients to Office 365. In fact, it’s frequently the first initiative performed for a client as part of a broader managed services package. Our background in Office 365 migrations enables our clients to get up and running quickly with minimal interruption. Users will appreciate only needing to log in once to access all applications available from Office 365. In addition to a predictable monthly cost, your service levels can be easily scaled as your needs change. 1 TB of storage per user. When you adopt Office 365 and you are using other managed service offerings from Corserva, you gain a single integrated monthly bill for all services. First-class, local, 24x7x365 support to maximize uptime, accelerate development, and lower costs. Why should you outsource Microsoft Office 365 to Corserva? Corserva provides the same plans that are available directly from Microsoft. By making this service part of a comprehensive solution with Corserva, you gain the advantage of a single point of contact for service administration, gain access to implementation experts, and eliminate the need to troubleshoot problems if Office 365 encounters issues. Corserva also provides migration services for Office 365. Why should I outsource my Office 365 migration project? 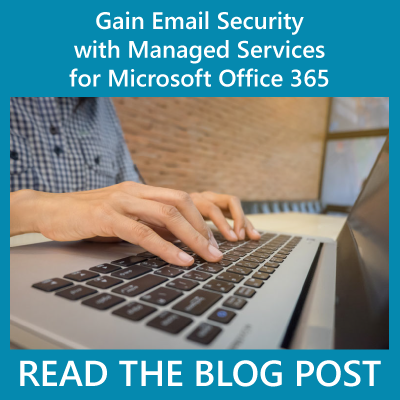 How can I improve the email security of Office 365? Can Office 365 help me comply with NIST 800-171?